Author contributions: van de Meeberg MM is first author and composed the manuscript; Derikx LAAP and Nissen LHC contributed equally in writing the manuscript; Sinnige HAM, Nooijen P and Schipper DL revised the manuscript; Schipper DL also provided the case. Institutional review board statement: This case report was exempt. Informed consent statement: The patient gave verbal informed consent prior to composing the manuscript. Hepatosplenic T-cell lymphoma (HSTCL) is a rare non-Hodgkin lymphoma with a high mortality rate. Higher incidence is reported in patients with inflammatory bowel disease, specifically in male patients that are younger than 35 years, and have been treated with thiopurine and tumor necrosis factor (TNF)-α inhibitor combination therapy for over 2 years. In this case report we describe a 47-year-old patient with Crohn’s disease (CD) who developed HSTCL after having been treated with thiopurine monotherapy for 14 years. To our best knowledge, only eleven cases exist of patients with CD who developed HSTCL while on thiopurine monotherapy. We report the first patient with CD, older than 35 years, who developed HSTCL while on thiopurine monotherapy. This emphasizes that HSTCL risk is not limited to young men receiving both thiopurines and TNF-α inhibitors. Core tip: In this manuscript we provide an overview of all known cases in literature with Crohn’s disease (CD) who developed hepatosplenic T-cell lymphoma (HSTCL) while on thiopurine monotherapy. In addition, we present our case of a patient with CD on thiopurine monotherapy who developed HSTCL at a relatively old age. This emphasizes that HSTCL may develop at all ages, even when the patient is solely on thiopurine monotherapy. Hepatosplenic T-cell lymphoma (HSTCL) is a rare subtype (1%) of peripheral T-cell non-Hodgkin lymphomas. It is an extranodal and systemic neoplasm deriving from cytotoxic T-cells, usually with a gamma-delta (γδ)-T-cell receptor type. These atypical lymphocytes display global infiltration in the splenic red pulp and in the intrasinusoidal space in the liver and bone marrow. As a consequence, patients present with hepatomegaly (77%), splenomegaly (96%), constitutional symptoms (70%), anemia (85%), thrombocytopenia (89%), leukopenia (72%) and liver enzyme abnormalities (46%), in the absence of lymphadenopathy. HSTCL mainly affects male adults with a median age of 20 to 35 years[1,3]. HSTCL has a rapidly progressive course with a mean overall survival less than 16 mo, regardless of the available treatment modalities (chemotherapy, splenectomy, bone marrow or stem cell transplantation). The incidence of the highly lethal HSTCL is very low in the general population. However, at least 10% of HSTCL arises in inflammatory bowel disease (IBD) patients treated with immunomodulatory therapy (thiopurines and/or tumor necrosis factor (TNF)-α inhibitors). This results in an increased HSTCL risk in IBD patients compared to the general population, although the absolute risk remains low[1,5]. Especially men younger than 35 years with Crohn’s disease (CD) who are treated with thiopurines and TNF-α inhibitor combination therapy for at least two years are at increased risk. The estimated absolute risk to develop HSTCL in IBD patients treated with combination therapy is 1:22000 in general and 1:3534 for men younger than 35 years old. By contrast, IBD patients on thiopurine monotherapy had an estimated absolute risk of 1:45000 and 1:7404 in general IBD patients and men younger than 35 years old, respectively[4-6]. IBD patients with HSTCL have a poor prognosis with a median survival of seven to eight months[7,8]. In this case report, we present a 47-year-old male CD patient on thiopurine monotherapy. To our best knowledge, this is the first case report describing an IBD patient on thiopurine monotherapy who developed HSTCL at an age older than 35 years. A 47-year-old Caucasian man with CD presented at our hospital with painless icterus, weight loss and malaise, without fever. He had a 33-year history of penetrating CD in the colon (Montreal Classification L2, B3 + P) and was treated with thiopurine monotherapy at presentation. Initial CD treatment had consisted of budesonide and mesalamine which was followed by azathioprine 150-200 mg per day for 14 years. Subsequently, he received infliximab at the age of 33 (three doses, remission induction therapy) and 36 (maintenance therapy for one-and-a-half years, discontinued due to neurologic side-effects). During his course of CD, he underwent both right and left hemicolectomy (at the age of 18 and 30 years, respectively) and received a permanent ileostomy at the age of 41 due to active perianal fistulating disease in the three years before. CD had been in remission in the five years preceding presentation at our hospital. Physical examination of our patient revealed hepatosplenomegaly in the absence of lymphadenopathy, which was confirmed by computed tomography and positron emission tomography (Figure 1). Laboratory testing indicated anemia, thrombocytopenia and liver test abnormalities (Table 1A). Imaging did neither reveal dilated bile ducts nor other (obstructive) abnormalities. Furthermore, viral causes of hepatitis, including Epstein-Barr virus, were excluded by serology. Based on these results, we suspected an hematological malignancy and performed a liver and bone marrow biopsy. Liver biopsy showed sinusoidal and portal infiltration of atypical lymphocytes (Figure 2). Immunophenotyping of both biopsies confirmed a T-cell population with the surface proteins listed in Table 1B. Based on these biopsies, γδ-HSTCL was diagnosed. Table 1 Results of our patient. ALP: Alkaline phosphatase; ASAT: Aspartate transaminase; ALAT: Alanine transaminase; GGT: γ-glutamyl- transferase; LDH: Lactate dehydrogenase; TIA: T-cell restricted intracellular antigen. Figure 1 Positron emission tomography showing hepatosplenomegaly with increased metabolic activity in liver, spleen and bone marrow. Left: Coronal plane; Right: Sagittal plane. Figure 2 Liver biopsy showing hepatosplenic T-cell lymphoma. Left: Hematoxylin and eosin staining (magnification × 100) showing intrasinusoidal and portal infiltration of atypical lymphocytes; Right: CD3 staining (magnification × 100) showing neoplastic cells (appearing in brown colour). Following the diagnosis of HSTCL, high dose corticosteroids (125 mg per day) were administered, followed by chemotherapy (CHOP regimen; cyclophosphamide, hydroxydoxorubicin, vincristine and prednisone). Despite this treatment, both clinical and biochemical parameters rapidly deteriorated and the patient died 21 d post-diagnosis due to massive esophageal bleeding, secondary to therapy-induced mucositis. In this case report, we presented a male CD patient who developed HSTCL at the age of 47 years and after having been on thiopurine monotherapy during 14 years. Remarkably, this rare malignancy developed at an age older than 35, which is in contrast with previous cases in patients on thiopurine monotherapy. As HSTCL is very rare, and controlled cohort studies are lacking, this case report may contribute to the assessment of HSTCL risk and its relation with immunosuppressive therapies. IBD patients, especially CD patients, are twice more likely to develop any lymphoma, regardless of immunosuppressive treatment[9,10]. The risk to develop HSTCL is also increased in auto-immune disorders like rheumatoid arthritis[11,12], specifically in those patients, treated with TNF-α inhibitors, and in immunocompromised patients with, among others, renal or heart transplant. In IBD patients, thiopurine treatment is associated with a significantly increased overall risk (rate ratio of 1.41) of developing cancer, specifically non-melanoma skin cancer, urinary tract cancers and lymphoproliferative disorders (multivariate adjusted hazard ratio of 5.28)[10,14]. More specifically, thiopurines promote development of lymphomas: a recent meta-analysis found an overall standard incidence ratio for lymphoma of 5.7 in IBD patients receiving thiopurines, but not in patients formerly treated with thiopurines or patients who had never used these drugs. The excess risk can be reversed by thiopurine withdrawal. Thiopurine cytotoxicity is mediated by the incorporation of 6-thioguanine during DNA replication in targeted cells, instead of guanine, which ultimately leads to apoptosis. Previous studies showed a higher absolute risk of developing HSTCL in patients receiving both thiopurines and TNF-α inhibitors, compared to patients on thiopurine monotherapy[4-6]. Furthermore, a review including 25 IBD patients with HSTCL reported an increased HSTCL risk in those on thiopurine monotherapy compared to patients using TNF-α inhibitor monotherapy. Duration of immunosuppressive therapy may also influence the risk of developing HSTCL. For example, more than 80% of HSTCL cases occur in the first two years after initiation of combination therapy. Median time from initiation of thiopurines to HSTCL development did not significantly differ between patients on thiopurine monotherapy and combination therapy (5.5 years vs 6 years, P = 0.39). A review of the literature revealed 38 cases of γδ-HSTCL in patients with CD, including 27 patients on combination therapy and 11 on thiopurine monotherapy (Tables 2 and 3)[7,15]. In contrast to these previous cases, our patient developed HSTCL after a longer period of thiopurine treatment (14 years vs a mean time of 5 years in the previously reported cases) and at an older age (47 years). HSTCL in general mainly affects men with a median age of 20 to 35 years[1,3,4]. Only 7 CD cases are known to develop HSTCL at an age older than 35, all of them were receiving combination therapy (Table 2)[7,15]. Time to HSTCL development following initiation of thiopurine treatment was reported in three cases, including 5.5, 7.3 and 13.5 years. In addition, all ulcerative colitis patients on thiopurine monotherapy (7 cases) developed γδ-HSTCL below the age of 35[4,5]. Finally, our patient had a very short survival (21 d) in contrast to previous cases (Table 3) with a median survival of 7-8 mo. Table 2 Number of Crohn’s disease cases with hepatosplenic T-cell lymphoma[7,15]. Table 3 Cases of γδ-hepatosplenic T-cell lymphoma in patients with Crohn’s disease on thiopurine monotherapy. 1Received one single gift infliximab 51 mo before presentation, therefore considered as TNF-α inhibitor naive. AERS: Adverse Event Reporting System; AZT: Azathioprine; Ch. : Chemotherapy; CHOP: Cyclophosphamide, hydroxydoxorubicin, vincristine and prednisone; EHSAP: Etoposide, methylprednisolone, cytarabin, cisplatin; ICE: Ifosphamide, carboplatin, etoposide; IVE: Ifosphamide, carboplatin and etoposide; NS: Not specified; (H)SM: (hepato)splenomegaly; SCT: Stem cell transplantation; 6MP: 6-mercaptopurine. The proven benefit of thiopurines in combination with TNFα inhibitors to maintain corticosteroid free clinical remission and mucosal healing should outweigh the risk of serious infections and secondary malignancies, such as untreatable lymphoma. Therefore, the recent published European Crohn’s and Colitis Organisation guideline recommends to limit the duration of combination therapy to 2 years, if possible. In addition, de-escalation of monotherapy (drug cessation or dose reduction) has to be considered to reduce risk of secondary malignancies. Several factors impact this decision, such as disease phenotype and extent, duration of remission, prior surgery, and a history of cancer. Given the prolonged clinical remission in our case, thiopurine withdrawal could have been considered to reduce HSTCL risk, although the extensive, relapsing disease course including surgery called for prolonged therapy. This case report presents the first IBD patient on thiopurine monotherapy for an extended period of time, who developed a γδ-HSTCL at an age older than 35 years. This highlights the clinical relevance of knowledge and awareness of HSTCL risk in patients with CD on immunomodulatory therapies. 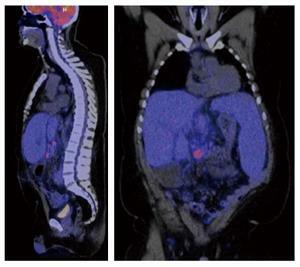 A 47-year-old male with Crohn disease with painless icterus, weight loss and malaise. Hepatosplenomegaly in the absence of lymphadenopathy and fever. Bile duct abnormalities, toxic hepatitis, viral hepatitis, liver cirrhosis. Anemia, thrombocytopenia and liver test abnormalities. Hepatosplenomegaly, with increased metabolic activity in liver, spleen and bone marrow. There are only 38 known cases of HSTCL in Crohn’s disease (CD) of wich eleven were using thiopurine monotherapy. This is the first patient with CD, older than 35 years, to develop HSTCL while on thiopurine monotherapy. HTSCL is a rare and letal lymphoma with an increased risk by using thiopurines monotherapy or thiopurine TNF-α inhibitors combination therapy. Authors are emphasizing that HSTCL risk is not limited to young males receiving both thiopurines and tumor necrosis factor-α inhibitors. The literature is described well, the authors report in detail information regarding the other patients affected from this rare condition. The review of the literature pertaining to HSTCL in inflammatory bowel disease is through.